A local group in Mizoram organised a 'beef party' on the day of Rajnath Singh's visit. Union Home Minister Rajnath Singh on Monday said the Centre will not impose any restrictions on people's choice of food. The same assurance had been given earlier by Union Minister Venkaiah Naidu following the criticism by several states that the Centre, through its new rules on cattle trade, was interfering in the people's choice of food, which is a fundamental right. 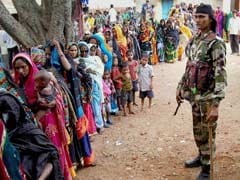 The Home Minister was in Mizoram to attend a meeting of the Chief Ministers of four northeastern states to review security along the India-Myanmar border. His comment came during a response to a media query regarding the Central rule, which bans purchase and sale of cattle at animal markets for slaughter. 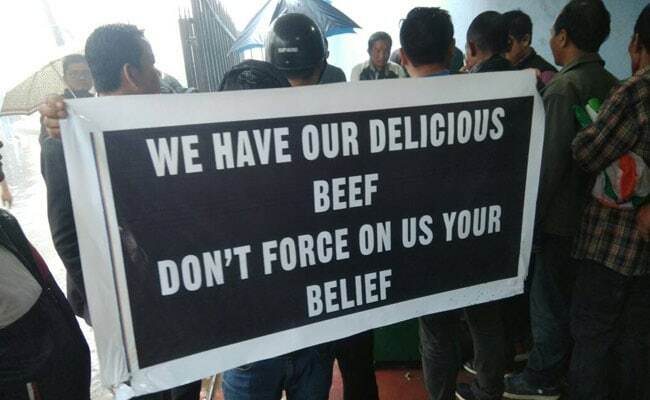 The northeastern states, where beef is staple, have already witnessed a number of protests by locals. In neighbouring Meghalaya, two senior BJP leaders quit the party in protest against the rule. On Monday, the Meghalaya assembly passed a resolution against the rule. The opposition also voted in its favour. In Mizoram, hundreds of people participated in a "beef party" organised by a local group which coincided with the home minister's visit. Braving heavy rains, more than 2,000 people gathered at the Vanapa Hall, just 200 metres from the Raj Bhavan, where Mr Singh presided over the Chief Minister's meeting. Over 2,000 people participated in the 'beef party' in Aizawl, close to where Rajnath Singh was holding a meeting. "Earlier, there was no objection to eating of beef. But now, we see a conspiracy to deprive us of some of our basic rights.," Remruata Varte from Zolfie, a local organisation which held the beef party, was quoted as saying by news agency IANS.